My grandmother in 87 years old. Cooking with her is an experience. 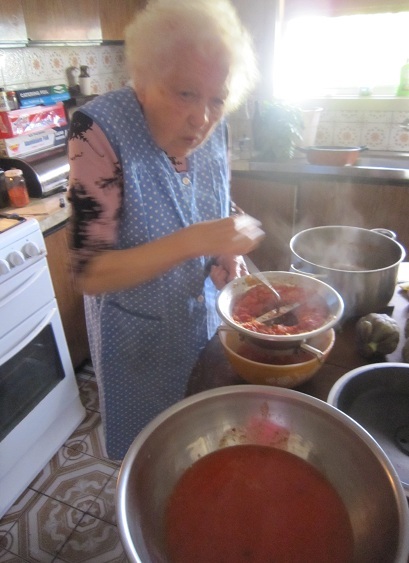 Trying to get quantities when writing down nonna’s recipes is like trying to get a bank to waiver its account keeping fees. 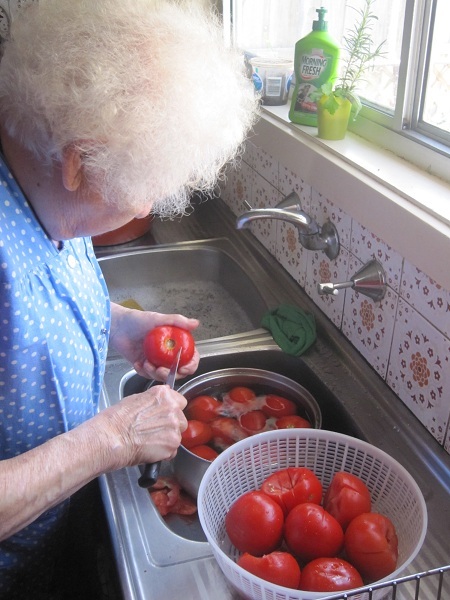 “First, I put the tomatoes in the pot,” she demonstrates. “Ok, how many carrots then, and onions? 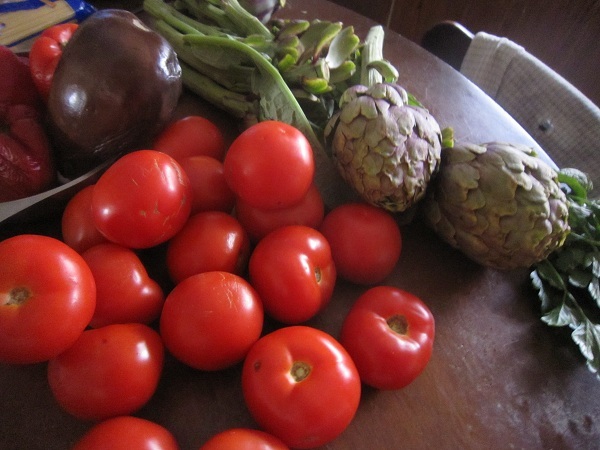 I am told to cut the vegetables. I stupidly ask how she would like them. Diced? Quartered? The answer, you can probably guess, is however I like. 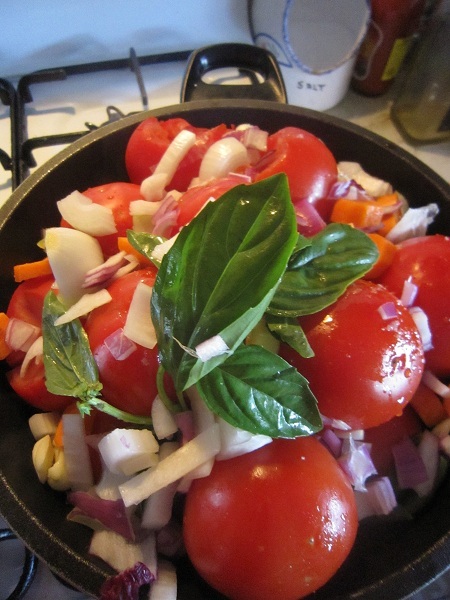 I start to brunoise the onion, the way I had been taught at cooking school. She stops what she’s doing to watch . At that moment the nearly blunt knife doesn’t make a clean cut and the slippery onion falls from my fingers to the floor. 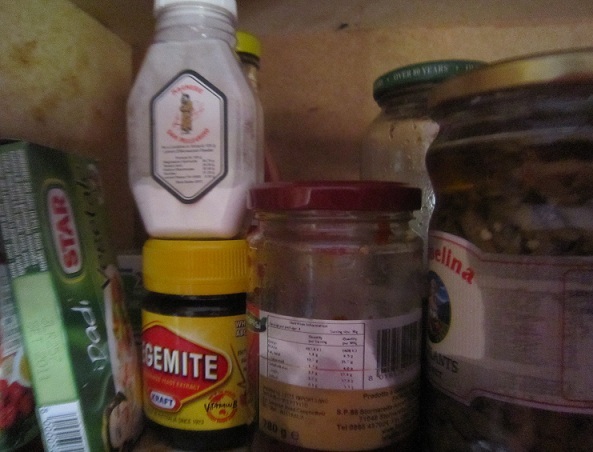 Next to the eggplants preserved in oil and under a bottle of Magnesia San Pellegrino, I spy a jar of Vegemite in nonna’s cupboard. I am shocked. I know of no Italian-born individual who can stomach the stuff. I decide to investigate. “Oh no. It’s for (my second cousin) Tony. He ate it on toast every day for a year but then he stopped. He doesn’t come much anymore,” she sighs. “Do you want it? Take it, take it, ” she urges. A few minutes pass and we chop in silence. She pauses for a minute. Zio Sam, nonna’s brother, comes home. 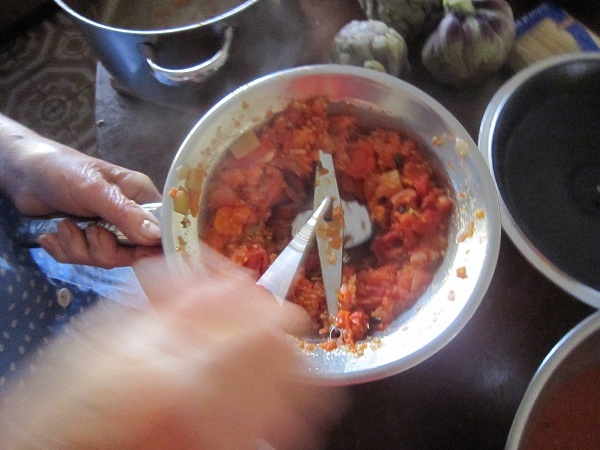 Noticing the tomatoes we are cooking, he tells me at the grocer where he works they cost $5 a kilo. Hydroponics $10. “Is that cheap or expensive, “ I ask ignorantly. I guess he means scarce but the price is sort of scary, when you think about it. Nonna takes a break from cooking to check on her faithful companion, Fifi the dog. Fifi drops her head and continues to ignore Nonna. What does the bicarbonate do? Very curious because I’ve never heard of it being added to sauce before. Teach me! 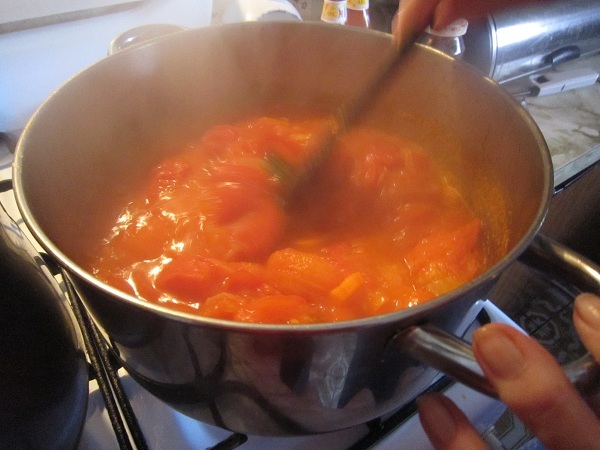 Well, according to my nonna, it removes “the acido” – any acidity in the tomatoes. Although i made it yesterday and didn’t use the bicarb and it was fine (it was also orange instead of red but this was because i put in too many carrots). Thanks for the great tips! 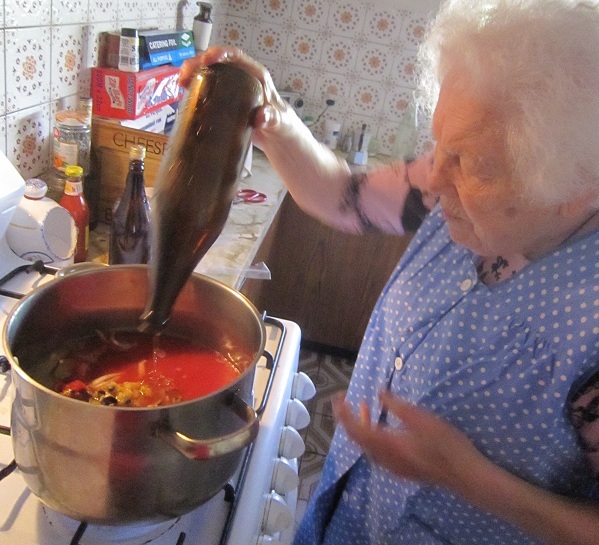 I wish had asked my Nonna more about her cooking before she died. 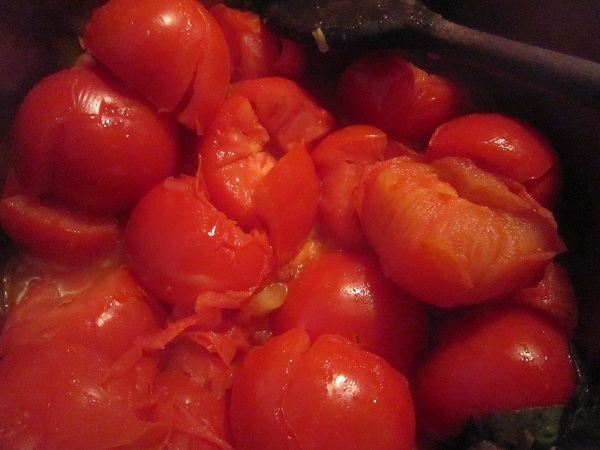 Quick question, how long roughly does the tomatoes take to break down? I’m just wondering if the onion and carrot etc have enough time to cook/soften etc? 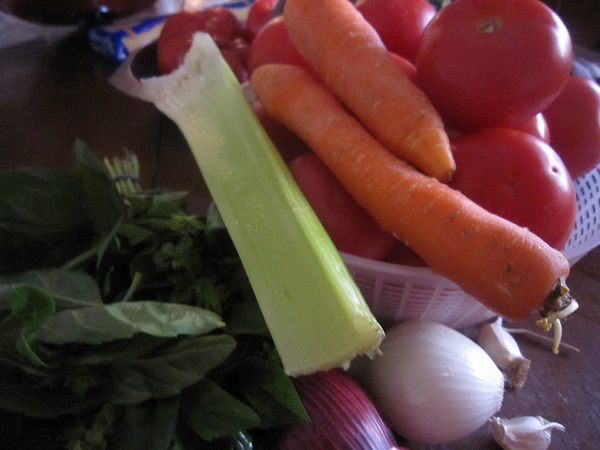 Thanks for your comment – by the time the tomato breaks down the onion and carrot will be soft – from memory it’s about 20 minutes.